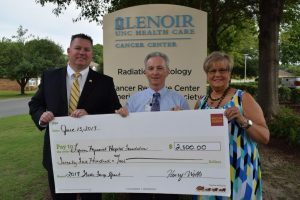 Wells Fargo Bank’s $2,500 gift helped to top off the Lenoir Hospital Foundation’s Linear Accelerator Campaign, making the total contribution to UNC Lenoir Health Care $838,000. Shown making the grant to Dirk Griffith, Foundation Director (center), are Warren Jackson, Wells Fargo Market President for Wayne and Lenoir Counties (left) and Sandy Fisher, Wells Fargo Business Associate. The Cancer Center’s new linear accelerator ensures the most advanced technology is available to treat cancer right here in our community.